You have all seen the Facebook posts, the little teaser comments. Well, we can officially announce it. The North Bay Farmers’ Market is going to open an indoor Winter Market. 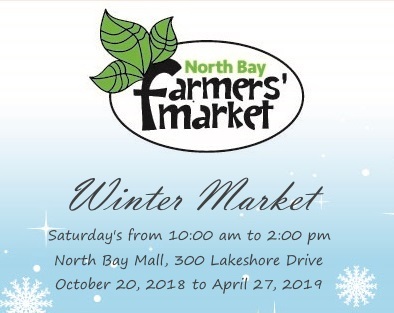 Starting Saturday November 5, from 10:00am to 2:00pm, at the North Bay Mall on 300 Lakeshore Drive, we will have a store front for our winter market. So come out to check our new venue. All vendors have been selected from our summer market membership, as this is our first indoor Winter Market and we wanted to give our seasonal vendors the opportunity to continue to support the market. You will recognise the 27 vendors who will be inside. Want a sneak peek at who will be at the Winter Market? You could have read the post on Facebook, or you can check out our Vendor Page on this website. We have a list of both the Summer and Winter Market Vendors. Continue to follow us on Facebook for updates and announcements. All information will be posted there about upcoming events at our new venue.